Diesel sport utility vehicles and super-high-powered luxury cars dominate the list of most environmentally incorrect vehicles. But even the biggest polluters today are cleaner than the average car 30 years ago. The Hummer H2 might be an obvious target for environmentalists, but unless it’s caked in mud, the hulking sport utility vehicle isn’t the filthiest ride on the road. 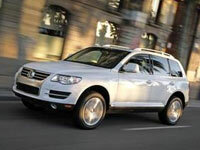 That distinction goes to another SUV: the Volkswagen Touareg V10 TDI. The diesel-powered Volkswagen Touareg V10 TDI is cleaning up its act for 2009 by adding new emissions technology that will help reduce its high exhaust emissions. The Hummer H2 does make the fifth spot on our list of top 10 worst polluters, thanks to its overall heft and gas-guzzling V8 engine, but what pushes Volkswagen’s Touareg V10 TDI to the very top of the ranking is its large turbo-diesel engine. It dumps so much exhaust into the atmosphere that the U.S. Environmental Protection Agency gives this midsize SUV its lowest air pollution score of 1. In Pictures: Is Ford’s Edge a Beauty or Beast? The EPA’s air pollution score is the main criterion for our ranking. It represents the amount of health-damaging, smog-forming airborne pollutants a vehicle emits. These primarily include nitrogen oxide, which combines with hydrocarbons to create smog; carbon monoxide, a colorless, odorless, poisonous gas; particulate matter that creates the black soot that lodges in lungs and deposits on buildings; and formaldehyde, a lung irritant and carcinogen. Heavy-duty pickup trucks and vans pollute more than the Touareg TDI, but they’re intended primarily for commercial use and weren’t included in our consumer-focused list. We excluded exotic Bentleys, Ferraris and Lamborghinis because they're produced in limited quantities and few consumers would consider buying one. Five other diesel-powered SUVs are right behind the Touareg TDI in our ranking of worst polluters. These include the Jeep Grand Cherokee CRD, the second worst polluter; the Mercedes-Benz GL320 CDI, which is third; and the Mercedes ML320 CDI and R320 CDI, tied for fourth. All get an air pollution score of 1. 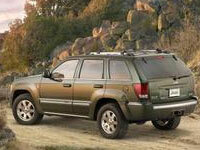 The Jeep Grand Cherokee CRD's diesel engine helped earn it the lowest possible air pollution score of 1. Not all of the ties on our list were avoidable, but to help break some of them we looked at each vehicle’s carbon footprint, the EPA’s way of quantifying other emissions called greenhouse gases. These include carbon dioxide, nitrous oxide and methane, which many scientists believe contribute to global warming. The primary greenhouse gas is carbon dioxide, but nitrous oxide and methane are also part of the mix. The Volkswagen Touareg V10 TDI has a carbon footprint of 12.4, which means it emits 12.4 tons of greenhouse gases annually, according to the EPA’s standard calculations based on 15,000 miles of driving per year. Burning one gallon of gasoline emits 20 pounds of carbon dioxide, the EPA says. The second-place Jeep Grand Cherokee CRD has a carbon footprint of 11.1 annual tons of greenhouse gases and the third-ranked Mercedes GL320 CDI puts out 10.6 tons annually. Auto emissions are 75 percent to 90 percent cleaner than they were before more stringent federal emissions standards were enacted in 1970, says EPA spokesperson Catherine Milbourn. “Even the worst polluters on the road today are far cleaner than most vehicles were a few decades ago,” she says. The worst polluter on our list, the Volkswagen Touareg V10 TDI, emits 83 percent less nitrogen oxide and 89 percent less carbon monoxide than the average vehicle built in 1970, according to EPA historical data. Widespread use of catalytic converters, exhaust gas recirculation, particulate filters and reformulated fuel are the main reasons today’s vehicles pollute less than their predecessors. And things will only get better: Some of the biggest polluters on our top 10 list will be cleaning up their acts for the 2009 model year, thanks to the advent of new diesel engine technology. They will start hitting the market late this year and are expected to receive an EPA air pollution score of 6. That’s enough to pass California’s stricter emissions standards, which so far have kept diesel vehicles from being sold there and in other so-called “green" states that have adopted California’s emissions laws: Connecticut, Maine, Maryland, Massachusetts, New Jersey, New York, Oregon, Pennsylvania, Rhode Island, Vermont and Washington. 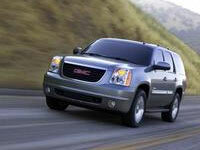 Choosing the base GMC Yukon instead of the high-end Denali version can save more than 130 gallons of gas per year. The easiest way to minimize your carbon footprint with your next car purchase is to choose a model with the best fuel economy possible. But you don’t have to choose the most frugal car on the lot to do your part for the environment. Experts say that realizing even minor improvements in fuel economy among the worst polluters on the road is the most efficient way to reduce greenhouse gas emissions overall. For example, choosing a base GMC Yukon with a 5.3-liter V8, which gets 16 mpg overall, instead of the high-end Denali version and its 14-mpg 6.2-liter V8 would save more than 130 gallons of gasoline per year for the typical driver, and eliminate 1.7 tons of carbon dioxide emissions, says Therese Langer, transportation program director for the American Council for an Energy-Efficient Economy. The EPA currently provides consumers with air pollution scores, fuel-economy estimates and greenhouse-gas-emission ratings for all passenger cars and light-duty trucks at www.fueleconomy.gov and www.epa.gov/greenvehicles. A few states have enacted regulations that will require automakers to post labels on vehicles detailing the amount of greenhouse gases each one emits, along with how that model compares to the average of all cars and trucks from its model year. California and Connecticut will begin requiring such labels beginning with 2009 models, and New York will follow suit for 2010 vehicles. Europe is ahead of the U.S. in requiring that such information be readily accessible to consumers. Although American consumers are becoming more aware of environmental issues, they’re a long way from choosing vehicles for purely altruistic ecological reasons. “By and large most people believe that they have a right, a God-given American right, to drive whatever car they want and can afford,” says Dr. Charles Kenny, a psychologist and president of The Right Brain People, a psychology research firm. “Americans still have a love affair with their vehicles, which are associated in their minds with freedom and independence."